With technology evolving at an unprecedented rate, there have never been so many exciting, state-of-the-art televisions available - it really is an exciting time in the world of television. Our collection of JVC televisions are fully equipped with everything you need to watch, record, stream, and pause your favourite shows, and so much more. And, with a wide range of sizes, features, and prices to choose from, there're sure to be a model that meets your needs. 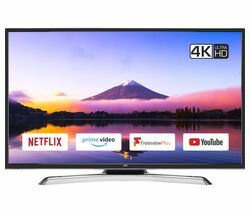 Featuring 4k Ultra HD TVs, Full HD TVs, HD Ready TVs, and Smart TVs, this range includes models such as the JVC LT-32C672 32" Smart LED TV, the JVC LT-32C365 32" LED TV with Built-in DVD Player, the JVC LT-49C770 49" Smart LED TV, and the JVC LT-42C550 42" LED TV. Our Smart JVC TVs feature built in WiFi and smart technology, allowing you to stream TV and movies from Netflix, surf the web, browse YouTube videos, and even keep your social media platforms up to date, all through your television. 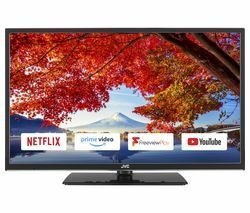 Or, if you're looking for something that will really make an impact, the JVC LT-55C760 Smart 55" LCD TV should certainly do the trick with its sizeable 55", 1080p resolution screen. Other features to look out for include Freeview Play, multiple connections, and TruSurround Sound. Oh, and with Freeview Play catch up TV, you'll be able to watch your favourite shows at a time that suits you. In addition to our collection of JVC TVs, we also offer a huge selection of televisions from the world's leading manufacturers, including Samsung televisions, Sony televisions, Panasonic televisions, Sharp TVs, and more. And, if you're hoping to connect input devices such as laptops and games consoles to your new JVC TV, make sure that you check out our range of HDMI cables for enhanced connections and ultimate transfer speeds.